Itinerary -Day 1 - Delhi Board the Train in the evening. Train leaves at 19:30hrs. 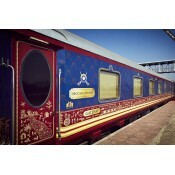 Dinner on bo..
Itinerary -DAY 1 - Delhi2045 :	Welcome & Check in formalities at Delhi Safdurjung Railway Statio..
Itinerary -DAY 1 - MUMBAI1430 :	Welcome & Registration at the Taj Mahal Palace Hotel.1545 :	Depa..
Itinerary -Day 1 - Mumbai Board the Train in the evening. Train leaves at 16:30hrs. Dinner on b..
Itinerary -Day 01 Monday Arrival : 1500 hours / Place: Taj West End Hotel, BangaloreAssemble at The ..
Itinerary -DAY 1 - Delhi2045 Welcome & Check-in formalities at Delhi Safdurjung Railway Station2..
Itinerary -DAY 1 - Delhi - Agra2045 Welcome & Check-in formalities at Delhi Safdurjung Railway S..
Itinerary -DAY 1 - Delhi -Agra0830 Welcome & Check in formalities at Delhi Safdurjung Railway St..